95 years ago today the Third Battle of Ypres, often somewhat erroniously referred to as Passchendaele, began. There are hundreds of books out there about Ypres and Passchendaele – some of which I am busily thumbing right now researching Portsmouth’s World War One Heroes! – and if you want to find out more about the battle there is certainly a lot of information out there. Suffice to say, Passchendaele has become, alongside the Somme, a byword for futility, needless slaughter and mud. To what extent this legacy is deserved has been debated keenly by historians in recent years. The campaign began with an assault on Pilckem Ridge, on the northern side of the Ypres Salient. Although the battle was relatively succesful, heavy rainfall turned the ground into a quagmire, which delayed subsequent operations and potentially gave the Germans time to reinforce their positions. 11 Portsmouth men were killed on the first day of Third Ypres. Seven of them were fighting with the 1st Portsmouth Pals, more properly known as the 14th Battalion of the Hampshire Regiment, who were involved in the attack on Pilckem Ridge. They were Private T.J. Fitzgerald (19, North End), Private Reginald Chamberlain (27, Forbury Road, Southsea), Private Frank Childs (a parishoner of All Saints Church), Private Henry Harnden (27, South Brighton Street in Southsea), Private G. Jerrard (23, College Street, Portsea), Lance Sergeant Joseph Wilkins (Dover Road, Copnor) and Private Ernest Shawyer (19, Lake Road, Landport). 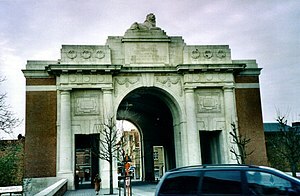 Fitzgerald, Chamberlain and Shawyer are buried in Buffs Road Cemetery, Jerrard is buried in Gwalia Cemetery while the rest are remembered on the Menin Gate Memorial in Ypres. Wilkins had been awarded a Distinguished Conduct Medal for bravery on the Somme the previous year. Portsmouth men also died serving with other units on 31 July 1917: Lance Corporal H.P. Evans (1st Bn Royal Inniskilling Fusiliers; parishioner of All Saints Church, buried at Artillery Wood Cemetery), Private Albert Jackson (11th Bn, South Wales Borderers; aged 32, Dickens Road, Mile End; remembered on Menin Gate), Private John White (26th Field Ambulance RAMC; age 20, Gunner Street, Landport; remembered on Menin Gate) and Private Moses Purkiss (196th Company, Machine Gun Corps; age 24, from Grosvenor Street, Southsea; buried in Vlamertinghe Cemetery) also fell. I’ve begun looking at microfilm copies of the Portsmouth Evening News from 1914, to try and get some kind of handle on what was happening in those heady days, and what public mood and reaction was like to the climactic events that took Britain to war. In July 1914, the crisis in Ireland was dominating news. In early 1912 the Liberal Government had proposed Home Rule for Ireland. Unionist in Ulster objected to the possible creation of an autonomous government in Dublin, and later that year the Ulster Volunteers were formed. In 1914, faced with the threat of civil disobedience, the Army in Ireland was ordered to prepare to act against any violence. Many officers and men refused to act, including the future General Sir Hubert Gough and Sir Charles Fergusson. The following scandal forced the Chief of the Imperial General Staff Field Marshal Sir John French, to resign. The Irish crisis was very much dominating news in July 1914, and the stormclouds gathering over Europe were received only very minor coverage. During July many of the areas Territorial Force units were on their annual camps. The Hampshire Fortress Royal Engineers Electric Light Companies were training with their searchlights at Southsea Castle, and the Wessex Royal Artillery were ‘enjoying’ what was described as a ‘dismal’ camp at Okehampton in Devon. The 6th Battalion of the Hampshire Regiment were in camp at Bulford on Salisbury Plain. The reports from these camps made little or no mention of European Affairs. Elsewhere the traditional English summer season carried on regardless, with the horse racing at Goodwood and Cowes week planned for early August. However, by the end of July, with the mobilisation and counter-mobilisations taking place among the European powers, the threat of war was beginning to be taken more seriously. The Kings Harbour Master posted a lengthy ‘notice to mariners’ in the Evening News, warning that there would be stringent restrictions on watercraft in Portsmouth Harbour and the Solent, and that navigation lights were subject to being turned off without prior warning. Whilst usually naval movements in Portsmouth were publicised in the Evening News, with the coming of war these movements were taken out of the public domain, with the editorial of 30 July 1914 stating ‘…especially in a town like Portsmouth is extreme reticence necessary’. A special late edition on the same day reported on the Austrian invasion of ‘Servia’. On 31 July Russia mobilised, and the King, of course a naval officer and a keen sailor, called off his annual visit to Cowes Week. On 1 August the 6th Hampshires were still in camp on Salisbury Plain, but were expressing ‘great excitement’ at the news from abroad. Goodwood was much quieter, as a great many naval and military officers have been recalled to re-join their units. Not all in Portsmouth were excited about the prospect of war, however. On 3 August an article in the Evening News advertised a Labour and Socialist protest against the war in Town Hall Square, to be held at 7.30pm the next day. Also on 3 August naval reservists were streaming into Portsmouth, and the submarine depot’s sports day was postponed indefinitely. The Government was to order full mobilisation the next day. The Evening News of 4 August, the day that Britain finally found itself at war, carried a slightly bizarre notice, announcing that ‘owing to the serious aspect of affair, Lady Fitzwygrams garden party on August 8th will not take place’. The Evening News began publishing late special editions, as the demand for the newspaper was reaching unprecedented levels. The day’s News also contained the first direct appeal for recruits, initially for the Territorial Force. Colonel A.R. Holbrook, the local recruiting officer, appealed for 680 men to join local TF units. A large ‘your king and country need you’ advertisement also drove the message home. The Labour and Socialist protest of the same day was described as an anti-climax, and ended with the police having to intervene after trouble flared with pro-war crowds. By 5 August, the war news had been promoted to the font page. Traditionally, 1914-era newspapers carried adverts on the front, and news inside. The local TF units had been mobilised, and the 6th Hampshires had returned from their summer camp, receiving an enthusiastic reception at the town station. On 6 August it was reported that the Portsmouth Board of Guardians – ie, those who ran the Workhouse – had offered their facilities to the Government, and other local buildings such as schools were rumoured to be about to be requisitioned. The Corporation, it eas reported, had been badly disorganised by the indiscriminate enlistment of many of its employees, leaving many vacancies behind. There was also a notice explaining ‘how the join the army’, directing recruits to local barracks, the post office or recruiting offices. This was very much in line with national patterns, where during August most recruits enlisted in either the regular Army or local Territorial units. By the end of August it was reported that over a thousand men in Portsmouth had enlisted. Whilst the first Pals type Battalion was raised by Robert White from among financial workers in the City of London, it was in Liverpool that the idea really took off. Lord Derby organised a recruiting campaign and managed to recruit over 1,500 men in two days. Speaking to his men, he said ‘this should be a Battalion of Pals’. Within a few weeks Liverpool had raised four Pals Battalions. 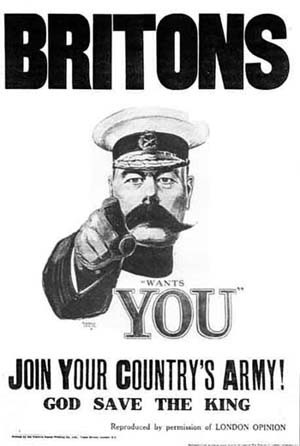 Inspired by Lord Derby’s enthusiasm, Lord Kitchener encouraged other areas around the country to raise similar units, writing letters to local authorities to suggest the idea. The normal machinery for recruiting men into the Army was swamped. Kitchener also had a very low regard for the Territorial Force. Hence the solution was to recruit completely new Battalions, in what came to be known as Kitchener’s New Armies. A key part of these New Armies were the locally raised, or Pals Battalions. As I have previously recorded, Portsmouth was the only town south of London to recruit what might be called Pals Battalions. Yet the impetus for recruiting a Pals Battalion in Portsmouth began much earlier than most of the more famous northern Pals Battalions. A report in the Evening News in late August stated that a Portsmouth Citizens Patriotic Recruiting Committee was being formed, and that a public meeting would be held in the Town Hall on 3 September 1914, when it was resolved that a Portsmouth Battalion should be formed. Among the speakers encouraging recruitment were Admiral Lord Charles Beresford, the town’s MP. The Town Hall was packed, with an overflow meeting on the steps being relayed the proceedings by megaphone. Hence Portsmouth was among one of the first towns to raise its own Battalions. By comparison, recruiting began for the Sheffield Pals on 10 September, and for the Accrington Pals on 14 September. Lord Kitchener soon wrote to theMayor to accept the Towns offer of raising a Battalion. The Evening News began to publish lists of recruits to the Battalion. Ominously, around this time the News was also publishing the first casualty reports from the Western Front and the first Royal Navy ships to be sunk. The First Victoria Cross awarded to a private soldier in the First World War has been sold at auction for £276,000. 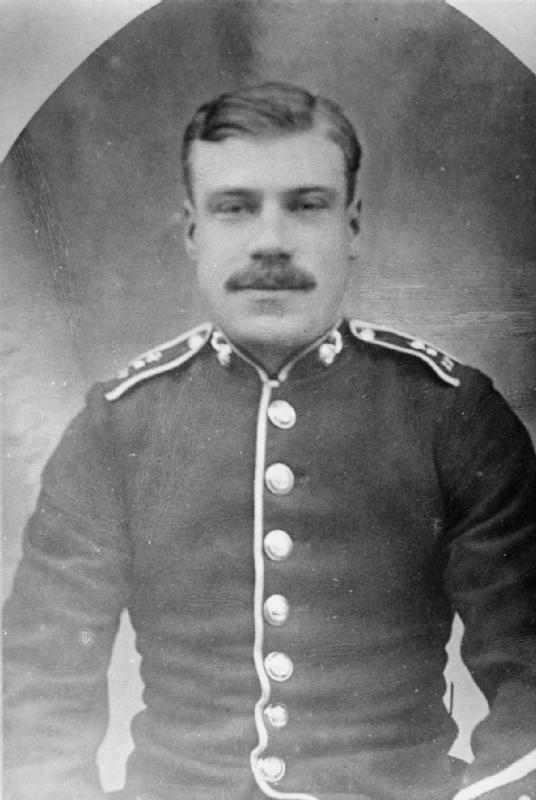 Private Sidney Godley, of the 4th Royal Fusiliers, earnt his VC at Mons on 23 August 1914 when he single-handedly managed to hold up a German advance on a bridge over the Mons-Conde Canal. Born in East Grinstead in West Sussex on 14 August 1889, he moved to London when he was 7 and later worked in an ironmongers store. On 13 December 1909 he joined the Royal Fusiliers, a Regiment that has traditionally recruited from London. In 1911 Godley was with the 4th Royal Fusiliers at Corunna Barracks near Farnham, and no doubt lived in Barracks in Portsmouth. The 4th Royal Fusiliers were one of the first units to go to France in August 1914, and found themselves facing the German Army at Mons in Belgium. Under heavy fire, he was wounded twice, with shrapnel in his back and a bullet in his head. He carried on the defence of the bridge for two hours while his comrades escaped, until he ran out of ammunition and was eventually captured. Godley remained a Prisoner of War for over four years until 1918, learning that he had been awarded the VC whilst in captivity. He received the medal from King George V at Buckingham Palace on 15 February 1919. He died on 29 June 1957, and was buried at Loughton Cemetery in Essex. Intriguingly, I was researching the 4th Royal Fusiliers only the other day, as in 1914 they were based in Portsmouth as part of 9 Infantry Brigade. One of the first photos that I saw was that of Private Gidley, with his distinctive moustache. The next day, unbeknown to me, his VC was sold. Something that has always intrigued me is the manner in which Portsmouth’s military heritage is often overlooked, compared to its naval past. Sure, we all know that Portsmouth is the historic home of the Royal Navy, but few people know about the long and enduring presence of the British Army in Portsmouth. It stands to reason that such a critical naval base and embarkation point will be a natural place for a significant Army garrison. The regular Battalions of the Hampshire Regiment were both based outside of Hampshire. The 1st Battalion were at the Essex garrison town of Colchester, while the 2nd Battalion were overseas at Mhow in India. The convention in the British Army for many years had been for one of a Regiment’s Battalions to be based at home in Britain, whilst the other would be based overseas in one of Britain’s colonies. In 1914 Portsmouth came under Southern Command, commanded by Lieutenant-General Sir Horace Smith-Dorrien. Smith-Dorrien later commanded a Corps in the BEF in 1914 and 1915. Southern Command was Headquartered at Salisbury, but the Portsmouth Garrison in particular was commanded by Major General W.E. Blewett CB CMG, the General Officer Commanding the Portsmouth Garrison. 9 Infantry Brigade, commanded by Brigadier-General F.C. Shaw, comprised the bulk of Portsmouth’s infantry. 9 Infantry Brigade had four Infantry Battalions under its command, and was designated as a part of the BEF to go overseas in the event of war breaking out. 1st Battalion Northumberland Fusiliers and 1st Bn Lincolnshire Regiment were barracked in Portsmouth, while the 4th Bn Royal Fusiliers were at Parkhurst on the Isle of Wight and the 1st Bn Royal Scots Fusiliers were based across the Harbour in Gosport. The Brigade was one of the first units to go to France in August 1914, fighting with the 3rd Division. Surrounded by fortifications, Portsmouth was also home to several Artillery units. 1 Heavy Brigade of Royal Garrison Artillery was based in Palmerston Forts nearby at Fareham, with 26 Battery at Fort Wallington, 35 Battery at Fort Fareham and 108 Battery at Fort Nelson. The Army Service Corps also had a strong presence in Portsmouth, with 12 and 29 Companies being based in the town, along with 62 Mechanical Transport Company. A section of 2 Coy of the Army Ordnance Corps was also based in Portsmouth. No 6 Company of the Royal Army Medical Corps was based at Cosham, I suspect at the new Queen Alexandra Hospital on Portsdown Hill. Portsmouth was also home to significant Territorial Force units. The 6th Battalion of the Hampshire Regiment had its Headquarters at the Connaught Drill Hall in Portsmouth. Much of Portsmouth’s defence, in the event of war, comprised Territorial Forces. The General Officer Commanding South Coast Defences, under Southern Command, was based in Portsmouth. 37 and 42 Companies of the Royal Garrison Artillery formed part of the inner defences of the Portsmouth area, while 29 and 67 Companies comprised the outer defences. III Reserve Brigade of the Royal Field Artillery was Headquartered at Hilsea, comprising 140 and 141 Batteries. The Artillery Barracks at Hilsea were located near Gatcombe Park, and several of the Barrack buildings still exist, including the Riding School. The Brigade’s 3 Depot was based nearby, close to Cosham Railway Station. 1 Wessex Brigade of the Royal Field Artillery had its Headquarters at St Pauls Road in Portsmouth, consisting of 1, 2 and 3 Hampshire Battalions RFA, and 1 Wessex Ammunition Column. Territorial units of the Royal Engineers were based in Portsmouth. Hampshire Fortress RE had its Headquarters in Commercial Road, with No 1 and No 2 Work Companies being based in Hampshire Terrace, along with No 4 Electric Lights Company. 3rd Wessex Coy of the Royal Army Medical Corps was also based in Portsmouth. In all, Portsmouth was home to several thousand Regular troops of Infantry, Artillery, Army Service Corps, Army Ordnance Corps and Royal Army Medical Corps. There was also a Brigade Headquarters and no doubt the usual support services that come with any substantial garrison. Soldiers would have been a frequent and daily sight to the townspeople. Interestingly, it seems that quite a few servicemen who went to France in 1914 with 9 Infantry Brigade had put down roots in Portsmouth. In particular, a not insignificant number of men who were killed serving with the 1st Northumberland Fusiliers and the 1st Lincolnshire Regiment seem to have been living in private residences in Portsmouth. Of course, neither Regiment could lay claim to southern Hampshire as a recruiting area, so it would seem that men from Northumberland and Lincoln who found themselves stationed in Portsmouth ended up marrying local girls and living out of Barracks in the town. Portsmouth was by no means a prominent Garrison in the manner of towns such as Aldershot and Colchester, or Salisbury Plain, but never the less the town did play host to a much more significant military force than most people are aware of. It is perhaps hard for modern Portsmuthians to imagine, considering that the Army garrison began to shrink after 1918 and nowadays consists solely of the Army contingent at the Defence Diving School on Horsea Island. If you think of a ‘Pals Battalion‘, you will invariably think of a bunch of lads from a northern, industrial working class town. Say, Hull, Sheffield, Manchester, Tyneside, or Liverpool. So ingrained has this perception of the pals become, that you could be forgiven for thinking that nowhere south of Watford Gap raised any similar units. I even remember reading on a military history forum that, in the opinion of one member, a Battalion had to be from the North of England to be entitled to be called a Pals Battalion. I’ve just taken Peter Simkins excellent ‘Kitchener’s Army: The Raising of the New Armies 1914-1916′ out of the library. It is without doubt a great history of how the New Armies were recruited and raised, and launched into action, and Simkins does give good coverage to some non-Northern Pals – the Royal Sussex Downs Battalions, for example, and the Cardiff Pals. Yet I am slightly amazed to find not one mention of the 14th and 15th Battalions of the Hampshire Regiment, or, as they were otherwise known, the 1st and 2nd Portsmouth Pals. I don’t think that history has been too kind to the Portsmouth Pals. Formed by the Mayor of Portsmouth and recruited locally, overwhelmingly from local young lads, many of whom no doubt knew each other, I think they are perfectly entitled to be called Pals. They served in the same manner as other better-known Pals Battalions, in particular at Flers and Guillemont on the Somme and again at Third Ypres, and were in New Army Divisions. Obviously, by the end of the war the numbers were being made up by men who were not from Portsmouth, but all the same, losses were horrific. The 14th Battalion lost 644 men killed, whilst the 15th lost 781 men. When we consider that the amount of wounded was often three times the number of those killed, then the two Portsmouth Pals Battalions lost their entire strength several times over as casualties. For Portsmouth to raise two Pals Battalions – or three if we count the 16th Battalion, the Depot Battalion – was nothing short of magnificent. Remember that a very large proportion of Portsmouth’s young men were already serving in the Royal Navy, working in the Dockyard or were perhaps already serving soldiers, Portsmouth being a significant garrison town at the time. Nowhere else south of London managed to equal this feat. The Royal Sussex Regiment did have three ‘Downs’ Battalions that could be refered to as Pals, but these recruited from a much wider area and didn’t quite have the same link to place as the Portsmouth Pals did. To put things into context, Southampton – at the time comparable in size to Portsmouth – did not raise any Pals Battalions of its own. Perhaps the people of Portsmouth were so keen to do their bit, as they were well used to sending young men off to fight, and it did not take too much to stir the martial spirit in a town that would have been full of serving and retired sailors and soldiers. I’m looking forward to reading the Portsmouth Evening News editions from those heady days in the summer of 1914. To what extent did these brave young men answer Lord Kitcheners call?